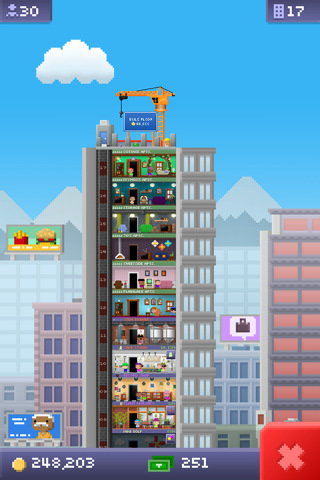 The iPhone, iPod Touch and iPad app Tiny Tower produced by Nimblebit is truly a treat for any iOS gamer who enjoys building cities or lifestyle simulators. The premise of the game centers around a skyscraper owner who wishes to see business thrive within it’s walls. 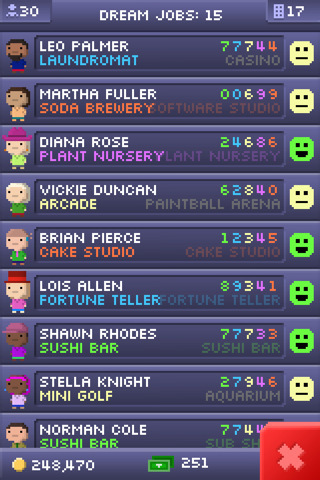 As Tiny Tower progresses, more and more floors become available and very diverse companies fill the new openings. As the manager in Tiny Tower, you must stock and supply all the stores while keeping customers happy with the amount of items in stock. This is both challenging and difficult, with a relatively linear learning curve. The customization for each individual building is superb, with different residents and businesses in each. The residents in Tiny Tower will talk to each other and formulate opinions on the manager, attempting to help their clientele to stay happy. This feedback can prove to be essential to gamers, and are welcome tutorials for inexperienced players. The price? Free for now! Zero dollars. That alone makes Tiny Tower a must grab app, and it could easily be sold for a few dollars, which will probably happen next. As of now, the value-to-return rate is astronomical, and the only thing lost will be the time spent managing your tower and making sure your patrons remain happy. While not the greatest free app to ever be released, this game will be a major time waster for anyone who plays. In fact, it reaches across demographics to create a positive experience for all involved. Young and old, male and female, anyone would have a great time playing Tiny Tower. The addition of unlockable content allows for gameplay to continue even after the main “quest”. Though it is hard to describe it as that since Tiny Tower never technically ends. 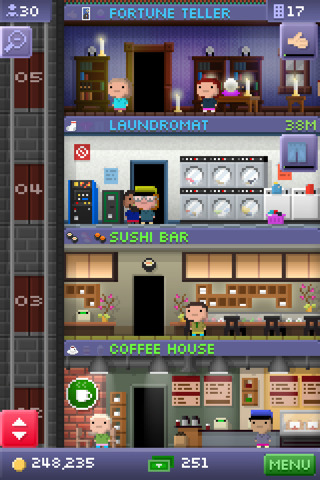 Tiny Tower does lack a multiplayer element, but this isn’t too big of a concern. While the touch screen does make it difficult to set commands, this is a similar problem for most applications on iDevices. It does not take much away from the gameplay and is generally the largest concern. Other concerns include the length of play (actions take quite a while to be completed) and graphical capabilities (still on par for any handheld game). Still, these issues are minor, and are overshadowed by the stellar sound and replay value. You might be asking, how in the world are these developers making money? There are in-app purchases called Tower Bux which entice you to speed up restocking and building of new floors. You can either buy these Bux or you can earn them, and naturally the latter takes longer. To earn Bux you’ll have to complete small quests, like finding a certain inhabitant in your tower. In terms of free apps available for Apple handheld devices Tiny Tower is near the top. The fact that it is free makes it essential to any gamer to download this application. The fact that it is a complete experience makes it essential for any gamer who’s into resource management apps. And best of all Tiny Tower comes as a universal app so you’re covered whether you own an iPhone, iPad or iPod touch. AppSafari review of Tiny Tower was written by Darius Reimm on June 24th, 2011 and categorized under App Store, Featured, Free, Fun, Games, iPad apps, Resource Management, Universal. Page viewed 7129 times, 3 so far today. Need help on using these apps? Please read the Help Page. Reminds me of a pc game from the mid 90’s called Sim Tower. You were in control of an office tower..had to control the elevators, people,jobs, etc.